Katlego Maboe-Celebrity Conference MC Crowned the most stylish male celebrity in SA at the 2014 YOU SPECTACULAR AWARDS, Katlego Maboe is the host of South Africa’s “Feel Good Breakfast Show” – Expresso that is broadcast of the country’s SABC on weekdays from 6AM – 8:30AM. The show, which was nominated for a 2014 SAFTA award for best variety show, has been on air since October of 2010 and continues to grow daily, reaching audiences all across the country and parts of Botswana, Lesotho and Swaziland, now available to book through Conference Speakers. Thereafter he proceeded to study for a B.Com degree in Chartered Accountancy at the North West University which he completed in 2007. Throughout Katlego Maboe-Celebrity Conference MC life, Katlego has been very active in cultural, sporting and academic activities, taking an interest in various sporting codes and even excelling to provincial level in some which include cricket and hockey. His biggest passion by far has been music since becoming a member of the North West Children’s Choir in 1998. One of the qualities that have led to his successes is his ability to communicate with people from all walks of life, a skill that is enhanced by the fact that Katlego is fully tri-lingual in English, Afrikaans and Setswana. He is a vibrant and goal-driven young man with a zest for life and an inexhaustible source of energy. 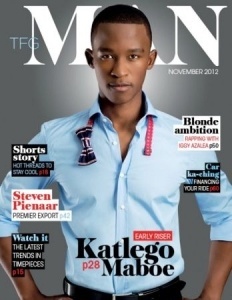 Follow Katlego on Twitter. His charismatic personality has endeared him to all those who have known him and he continues to steal the hearts of those around him.